Trade Shows, Banquets and conventions. What is predominant wind NC Kansas . Is Bowhunter education required ? How many 200" deer in KS are there? End of a FIVE year Romance. 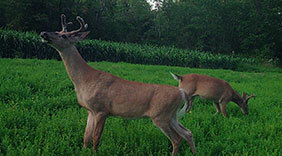 Our food plots generated some amazing results last year, and quite a few surprised. See which plots succeeded and what plots failed. 7 Hogs in 2 Days! Between the Eyes--Hog Bow Hunt!